This year Welsh spacerockers Sendelica turn 10 years old. * And The Cromlech Chronicles is their present to us. Prior to last year’s 13th Dream of Dr. Sardonicus festival, Sendelica recorded this album live in the studio with a minimum of overdubs. Most of the music is original, except for the cover of the legendary Flower Travellin’ Band’s “Satori,” which is also the first cover of a Japanese prog track on FdM. To set the context for the album, the word cromlech is a disused archeological term for standing stones, like Stonehenge. There just happened to be a cromlech close to their studio that is more than 3000 years old, which Sendelica features on the gatefold sleeve and the poster. Side one contains the side long “The Cromlech Suite,” consisting of four parts: “August 3rd 2015: The Alignment,” “Obscured,” “The Return of the Elohim,” and “Masters of the Universe: The Space Goats.” The first part lasts about two and a half minutes and is primarily swooping electronics, aligning the listener for the upcoming cosmic journey. As Sendelica segues into part two they add drums, guitars, synths, and saxophone and lots of reverb for a mind blowing space jam. The slow pulsating music ebbs and flows and picks up tempo as it segues to part three. Now the music becomes almost reverential and majestic, again building to a superb psychedelic jam of cosmic proportions. The fourth part slows down a bit with sustained chords, driving bass line, swirling guitars, electronics, and more sax. Whew! What a ride! Side two consists of three instrumentals. 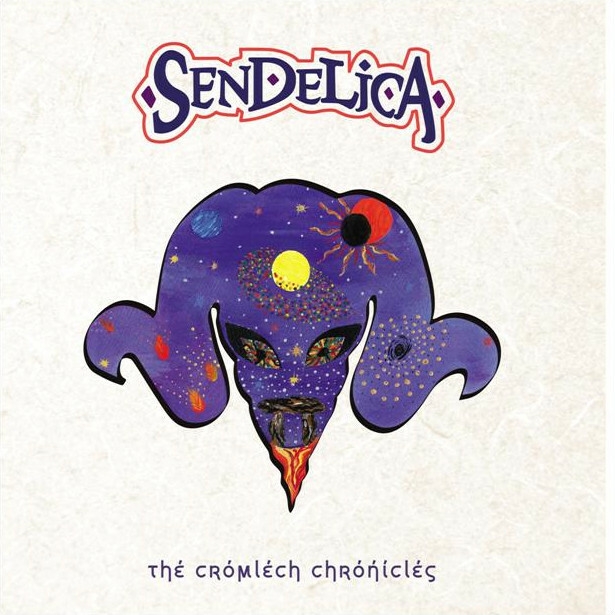 The first is Sendelica’s cover of “Satori Part 1.” The tune begins with an ambient intro that leads into a Black Sabbath type heavy bass line and organ that is rapidly lost within the swirling electric guitar solos and bed of reverbed chords. At times the music conjures images of a 60s spy movie soundtrack. Next is “Vellichor,” a recently coined word that means “the strange wistfulness of used bookstores, which are somehow infused with the passage of time — filled with thousands of old books you’ll never have time to read, each of which is itself locked in its own era, bound and dated and papered over like an old room the author abandoned years ago, a hidden annex littered with thoughts left just as they were on the day they were captured.” “Vellichor” is a particularly beautiful instrumental that at times is romantic, cinematic, or sci-fi soundtrack. And the album closer is “Zenosyne” another new word that is the sense that time keeps going faster. This is a sinister instrumental with a relentless motorik beat and bass line that anchors the steady pulse of time. On top of this foundation are energetic musical flights of fantasy, so much so that you don’t notice the passage of time. This excellent LP is sure to attract Sendelica many new fans. * - As a band, not individually. -ed.